A powerful effect by direct administration of the drug into the bloodstream. It strikes at once on a set of targets. This dosage form is applicable when it is not possible to take metronidazole tablets from https://bioflagyl.com/. Welcome to Cowboy Up Trails !!!! Looking for beautiful country, well marked trails, convenient camping with modern bathroom and shower facilities ? Come see us and you’ll see the difference. We have miles of riding trails over thousands of acres of magnificent Ozark National forest. Our trails may well be the highlight of your Arkansas vacation. 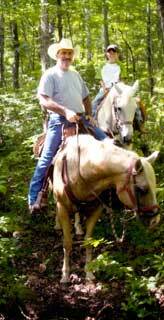 Spend the day or a week with us and enjoy the best horseback riding the Ozark Mountain country has to offer. Our trails cover hundreds of miles of the most beautiful scenery in the Ozark National Forest you can imagine. From the Indian Caves to ridge and valley views that can take your breath away. Our trails not only cover some of the most varied and striking terrain – they are well marked and GPS coordinate logged. Our Trail maps and trails are color coordinated with intersection markers marked so you can stay oriented as you explore our trail network. Contact us today and we’ll work to make you or your groups trail riding experience an enjoyable adventure.